We see the "pursuit of excellence" as a never ending vision for the care of our patients. 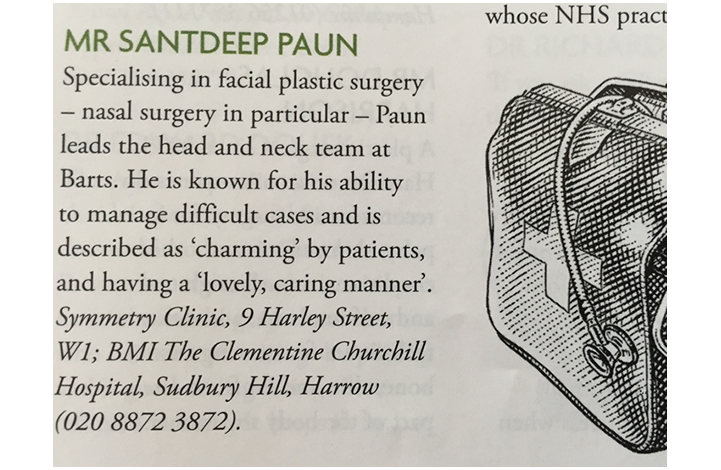 Our Medical Director, Mr Santdeep Paun has spent many years specialising in his field and strives at all times to reach ever increasing levels of excellence, realising that the exemplary standards of clinical care he sets should never be taken for granted. This starts from when our patients first contact the clinic and, hopefully, never ends as we value long term contact and relationship building. We pride ourselves in attention to detail and hope this reflects throughout our practice. All too often, clinics and doctors refer to their patients as clients, which infuriates us. The beauty business has encouraged this sort of thought by making the whole industry a commodity. By working with only the best allied specialists and anaesthetists and only in the finest hospitals, we look to make sure all aspects of what we do reflects or vision of the finest healthcare for our patients. Our cutting edge clinic and hospital facilities are fully accredited with the Healthcare Commission with safety a priority. The Symmetry clinic believes in responsible cosmetic surgery, keeping foremost the importance of ensuring patients understand what changes are possible without causing problems to underlying function. Rhinoplasty (plastic surgery of the nose), in particular, is an area where patients may not realise that excessive surgery can leave the patient with significant breathing difficulties. Much of the work at the Symmetry clinic involves correction of ill planned prior surgery, often performed by surgeons who don't specialise in this area who spare little or no thought to the functional consequences of their operations. Beauty may be the ultimate goal but it is important to have a nice looking nose that you can breathe through!